WanderMan: Bulb Check! - Sometimes They Are Out And You Don't Even Know. What LED bulb did u use? I tried them 5 years ago and they were terrible. Looking to try again if they are improved. I used ebay sourced china produced 1157 . These were the multi LED style,(and 1156) bulbs, 23 of them I believe. About 1.60 each. Meets the lumen requirements for DOT. 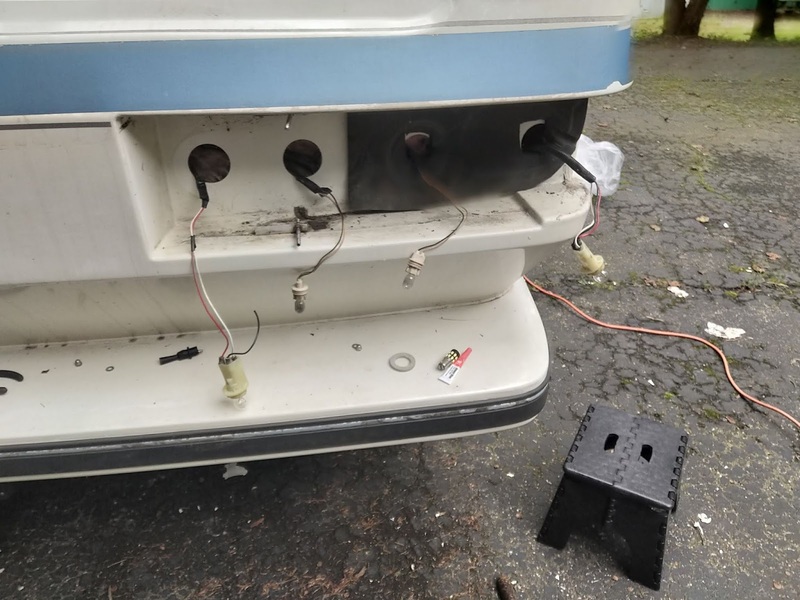 I have the standard "big red brick" type tail lights on my travel trailer, which means they don't even attempt to seal out dirt/rain worth a darn. As a result, the bulb contacts are ALWAYS corroding to the point my taillights go dim, flicker, and wink out. I've tried various contact-greases, and none seem to last long. 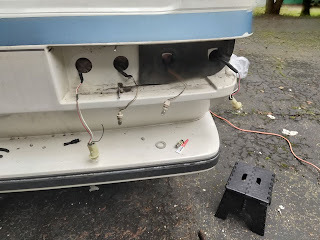 I finally got around to rewiring the taillights on my 24yo UTILITY trailer at home, which I did with $1.20 sealed LED panels instead of filament bulbs. These have 3 wires, two brightnesses, connect with twist-nuts (I soldered and heatshrinked for water resistance), and claim to last for hundreds of thousands of hours. I turned back to my travel trailer and "obviousness" struck. 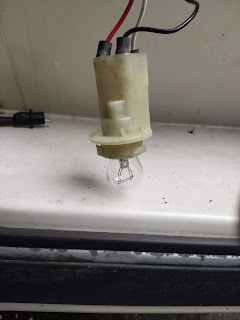 I soldered two more panels (a whopping $2.40/pair delivered) and left them right over the (vacant) bulb mounts in the trailer's "bricks" and they haven't flickered since. It WOULD be cleaner to remove the giant bricks completely, but then I'd have patch the original mounting holes. I still might do it. EXCELLENT Idea! I will be doing that to my other trailer...my car/helicopter hauler already has them. The ones I used on the travel trailer are about 2x5" (probably meant for single ATV/motorcycle tail? ), but they come in 2,3,4,5" rounds as well. Obviously I used red as my tail lights, but the same dual brightness modules also come in almost every color if you wanted white/green/blue/purple (illegal) taillights. something I learned and carry over from the military (AF and Army)...I walk around at least once with lights on to check all of them before leaving. Every few times I walk around with the turn signals on to make sure they work also. Only problem is can't check brake lights. i use a short pole and brace it on the brake and seat and move the seat close to be able to push the pole against the brake then I can check the brake lights Bill D.
Always a good idea. That was precisely how I ended up finding my blown out bulb. I do it when I fly...why not carry that over and do that on the ground as well.